Five years ago James worked up the courage to come out to his father. His father didn’t take it well. 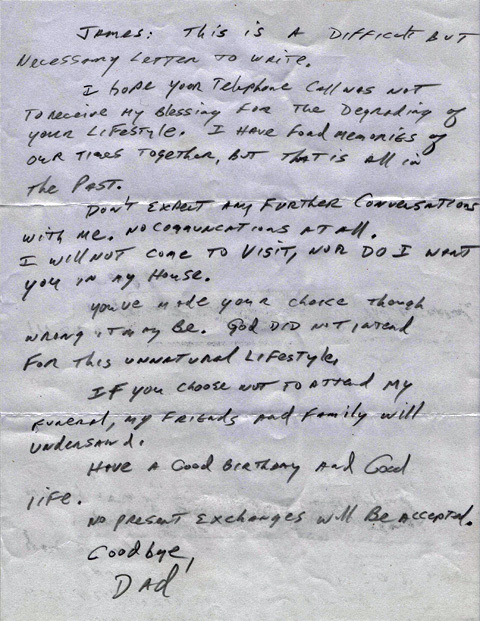 A week after telling his father he is gay, James received the letter above. I’ve typed it out below so that it’s easier to read, but reading it this morning it was even harder to read as I was a bit teary towards the end. How on earth can a father tell his son never to come home? In the comments on the blog post where James posted his letter, there is an amazing letter from a man who has much more of an idea about being a good dad. Read that here. “James: This is a difficult but necessary letter to write. It’s taken James 5 years to post the letter online, but it has gone viral since he has. I cannot imagine how devastating it must be to be rejected by your family. I’m so glad that my family, even though there was a bit of a struggle with the topic, never thought about shutting me out of their lives. His father should be ashamed. G-d did not teach fathers to hate and cast out their sons. I wonder if anything about their relationship has changed since he received the letter 5 years ago? Honestly, even if I was straight, if I learned that someone in my family or a friend disowned his or her child in such a cruel way, it would forever change my view of that parent. I honestly think it would cause me to lose that friendship. Having a child come out as gay does not mean you failed as a parent. Disowning your gay child means you failed as a parent. Fathers and mothers should provide unconditional love to their children. How horrible it must be to be a child who realizes that his father doesn’t love him. What Bible is this jerk reading? Yes, I saw this on fb yesterday posted by a guy I know socially who is from Boston but now lives in L.A. with his partner (also named James). I was wondering if this was a coincidence or not. I’ve known two guys whose parents disowned them after coming out. One killed himself by jumping from his 22nd floor apartment, the other who I dated shortly seemed to flourish and now lives in England and is happy. The only obvious difference between the two is that one had few if any friends, the other many. Friends and supportive family are so important and must not sit back and assume the person is OK. I still feel guilty that I didn’t do more to talk to the one that jumped. There are many of us who have experienced this and still are. I have a homophobic brother who has not talked to me in years. He wrote saying how much he hated my lifestyle and I have kept the letter since. Just be strong and proud of who you are. Just just be yourself, regardless of what people think.